My 'best' ten wells of the very many I've stumbled across - not necessarily the most spectacular or historic, just the ones that mean the most to me. Hopefully they give you some idea of the amazing variety of these ancient sites. 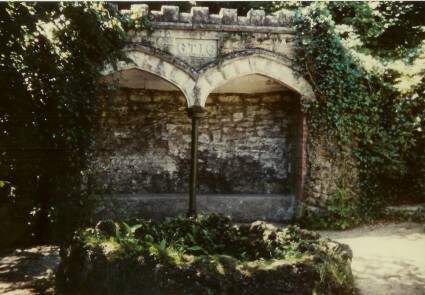 This was the very first holy well I visited, on holiday in Wales in 1984. 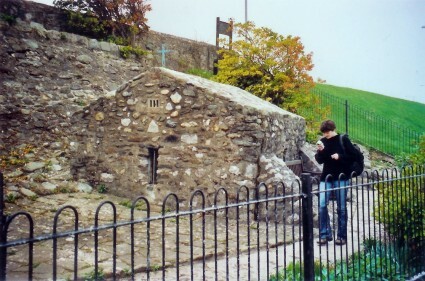 It sits in a tiny chapel on a scrap of grass just below the seafront, which has been identified as 6th-century but which could be of any date between then and about 1500. When we first saw it, the weather was dark and rain was whipping along the beach. 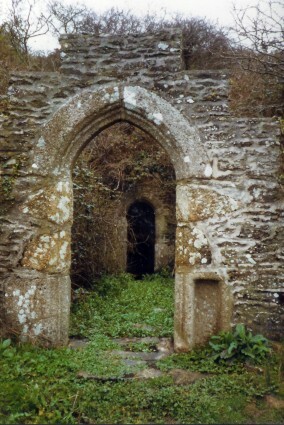 There were other visitors, but the chapel, with its well beneath the stone altar, seemed forgotten and deserted. Over the following years it became a minor pilgrimage site, with people leaving flowers, prayers, and other offerings - rather fun! I and Dr Bones came here in 2005. There was a good flow of folk coming and going. I first came here in 1985, once again in the rain! You have to traverse a caravan park, or you did then, and a couple of fields before reaching a tiny valley with the well-house beyond a restored stone arch. You can sit inside and watch the water should you be able to wedge yourself in. I found it a lonely, atmospheric place. 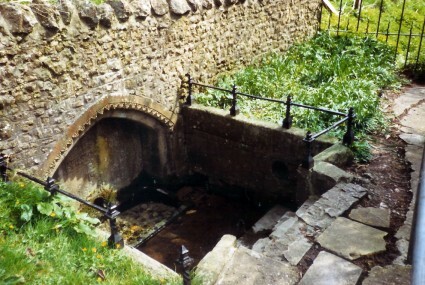 Also known as St Cuthbert's Well. Visited again in 2012, when you definitely needed wellingtons to negotiate the mud , water and weeds. This has become a favourite since our first visit in 1985. You walk down a path at the corner of the graveyard between a group of old lime trees known as the Twelve Apostles, and this lovely stone tank is at the bottom, slowly pouring water out through a stone channel and through the town. 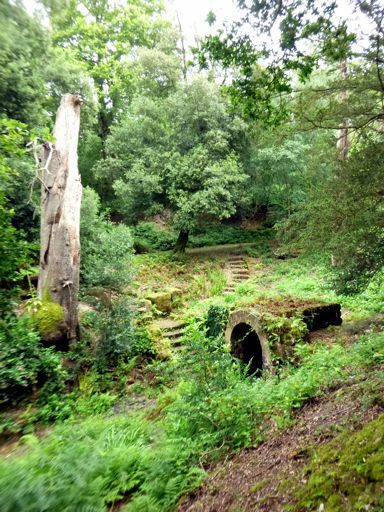 It used to be very atmospheric, but in Millennium year a new stone seat was put in alongside the well, and much of the undergrowth cleared away, so it no longer feels as isolated and lonely as it once did. It tends to dry out after prolonged hot weather, but the last time we saw it (in 2013) it was full of clear flowing water. Not many wells can boast their own restaurant and tea room! 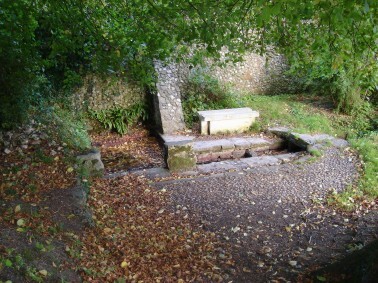 The Wishing Well was probably a 'proper' holy well once as it rises beside the church (see here for some Upwey graveyard pictures). Now it's a big round stone tank of beautiful clear water, flowing very strongly, with a mossy stone surround. They don't encourage you to drink from it now, but we have never suffered any ill effects! The well sits in ornamental gardens that are always getting more elaborate. It's been a delightful place for us since first coming here in 1986. This is a deeply strange and mysterious place. You go down a footpath out of the churchyard, over a couple of stiles and through a field, and find the well set into a high grassy bank. Once beneath the entrance stone you're in another world. Steps lead steeply down to a small bowl of cold water barely visible in the dark, prickling with damp moss. I came here in 1989 and felt I was encountering something very archaic, very primal, and not entirely comfortable. But I'd go again. I found this on a complete hunch in 1989. The Ordnance map showed a 'spring', that's all, at the bottom of SS Peter & Paul's churchyard. I thought I'd better check it out, and found - this! Amazing! Nobody had ever mentioned it, written about it, or published a photograph of it. Outside Cattistock it was presumably completely unknown; I suppose it was built when the church was reconstructed in the 1870s. What a find! How is it that the Bon Spring is not better known? Again marked on the map simply as a 'spring', this huge Gothic Revival folly was built by the great AWN Pugin while working on Oxenford Farm down the road for Viscount Middleton. It had a reputation for curing eye complaints but this gradually escalated until it was treated as a full-blown holy well in more modern accounts. I scrambled through the wood here in search of it completely unprepared for what I found - no photograph of the site had appeared before. 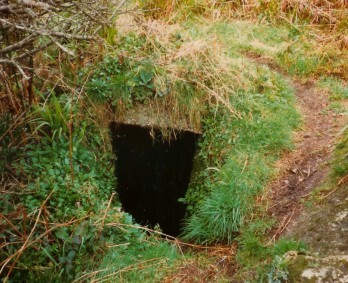 Quite a famous well, but still a sort of poor relation of the great pilgrims' well of St Winifred at Holywell in Wales. They seem to have both been built by Lady Beaufort in the 15th century, though, and this one still attracts pilgrims - when I and Dr Bones came here in 2005 there were coins and pictures of St Winifred left in the well-house. 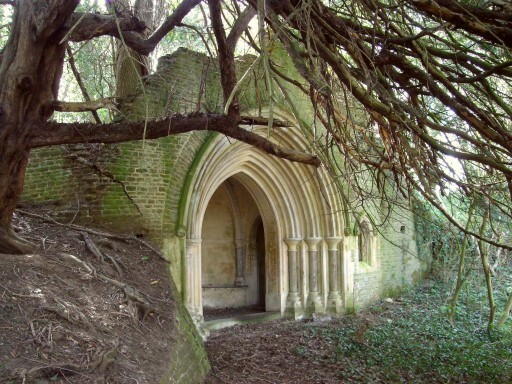 The little 'court house' on top - which may have been a chapel before it got used for legal purposes - is now owned by the Landmark Trust, so this is the only holy well in England that you can take a holiday in! On a recent holiday I made a trip to see St Seiriol's Well, next to what was supposedly the cell of the great sixth-century evangelist and founder of Penmon Priory. 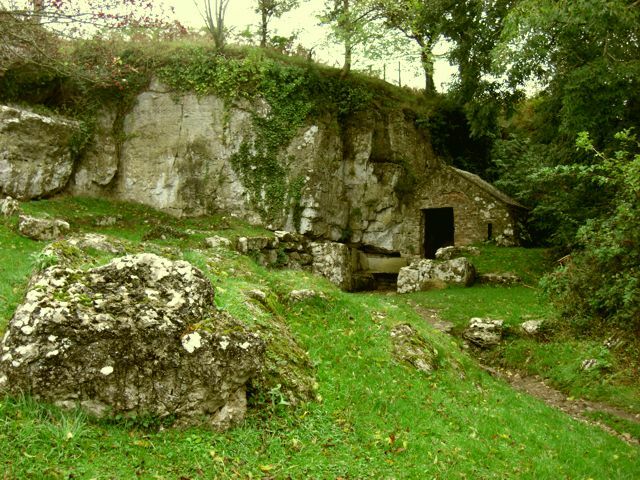 The whole arrangement sits within a small natural enclosure of stone now walled off on one side and reached by a path. 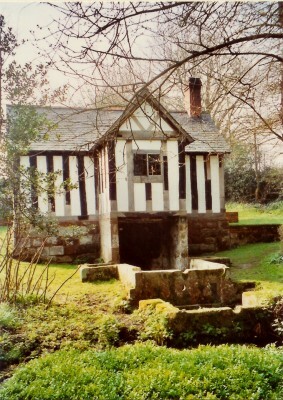 It isn't entirely proven that this was where St Seiriol and his companions spent their time, and certainly the upper part of the well-house was rebuilt in the 18th century, but although the site has something of the feel of a small theme park of Dark Age monasticism, you do gain a sense of connection with those remote times. A recent addition to this list, only visited in 2014. Ashburnham House is now a Christian retreat and conference centre, the remains of a great mansion set in a garden landscaped by Capability Brown in the 1760s. The Ladyspring Grotto is sometimes alleged to be his handiwork - somewhat unconvincingly, I think, as it seems like an antiquarian's attempt to recreate a Graeco-Roman nymphaeum, complete with narrow red Roman-style brickwork. You approach the Grotto along either a higher or a lower path up a gully leading from the lake, and the shrine's appearance is a wonderful surprise whichever route you take. The origins of this site may beobscure, but its impact is irresistible.